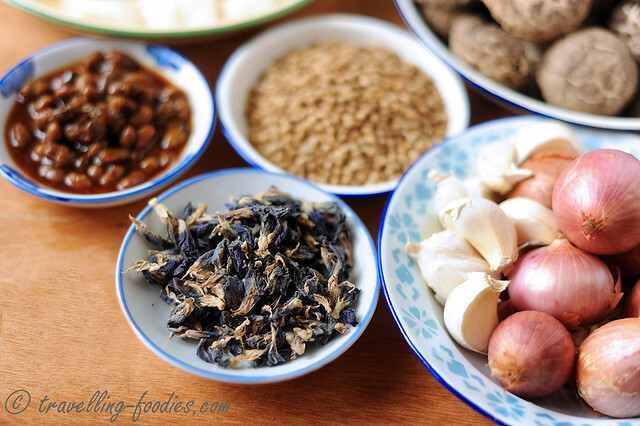 Ingredients for the traditional kueh chang babi, or nyonya glutinous rice dumplings as they are known to many. Each family’s recipe may differ slightly from the other in ratios, and of course an additional ingredient in this, which is missing in another, some forgotten, some forbidden from sharing in family recipes kept secret. 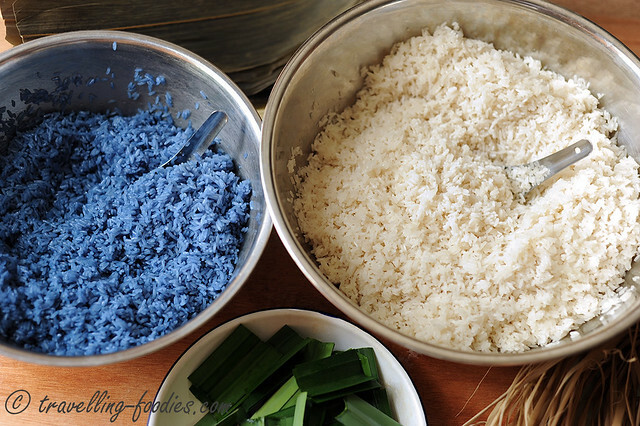 Another memory during the prep work for kueh chang is to pileh pulot (pilih pulut), that is to separate out and remove any rice grains which had been added into the bag of glutinous rice. 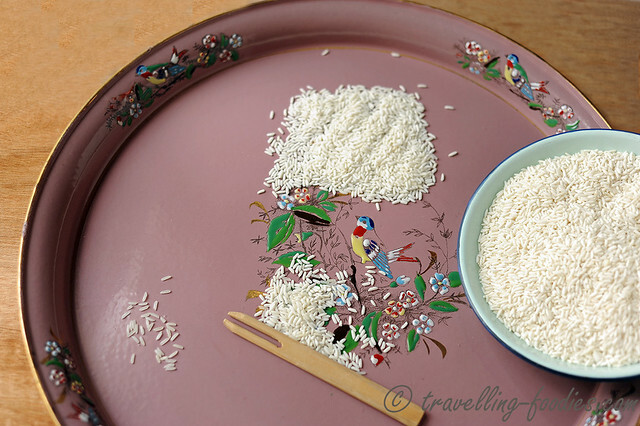 We used to do this on the kitchen floor, spreading the rice thinly over an enamel tray and carefully going through the grains, taking out the translucent ones, leaving behind the opaque white ones. It is a painstaking task, one which requires much “eye power”, something which is of lacking in recent years. Thankfully the quality of Thai glutinous rice has improved tremendously over the last couple of years and long gone are the days when one needs to pileh pulot, I hope! The choice of meat is important, that is the meat has to be sufficient fatty! Lean pork are a big no good and pork belly is best! Even with pork belly one needs to be discerning, choosing a good piece with good fat to meat ratio… at least 3:7 and if you can push it, 4:6! We don’t use the skin (rind) and would remove it for other use, i.e. like in sambal timun which I absolutely love! The fat layer(s) are also removed and cut up into small chunks and rendered for their oils. 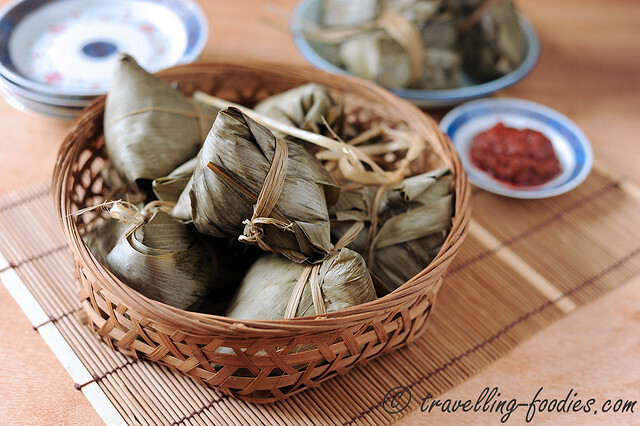 Part of the crunchy cracklings, known affectionately as “bak yew pok” are added during the cooking of the filling while the rest would go very well with noodles or even on their own as a snack! That was my childhood favorite ,incidentally one which I would still very happily indulge in with my bak chor mee! The meat is cut up into very small cubes, another arduous job which my grandma would undertake herself and trusted no one with it. I’d read with amazement, some “popular online” recipes which encouraged their readers for “convenience sake” to go with minced/ground meat instead. Well, texturally we know that minced pork is gonna be helluva different, not to mention the unknowing fat to meat ratio if the minced pork was just bought off the supermarket shelves. If time is really of essence, I would suggest going out to buy from a reputable kueh chang stall and not ridicule this old classic with minced pork. I say this harshly yes, because many parts of our culinary tradition are kept intact for precise and persistent reasons, and should in no way be altered, or faltered. It is going to take a lot more time and elbow grease to get a whole 1-2 kg slab of pork belly processed yes, but the results would be well worth the effort. 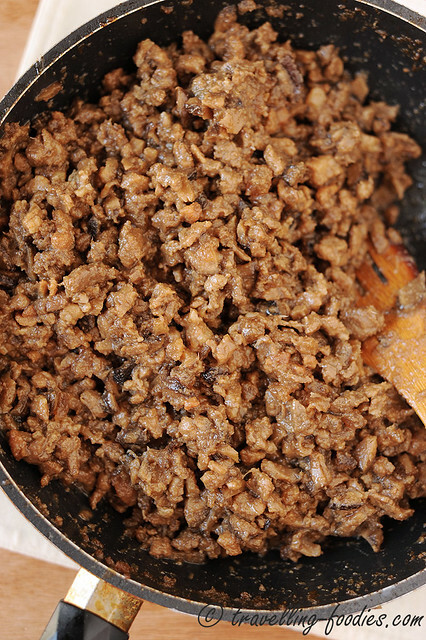 Minced pork unfortunately would not. A peculiar inclusion in kueh chang babi is candied winter melon aka “tang kwey tng“. It is a must for good kueh chang babi and make that lots of it! Not only does it load the dumpling filling with the sugary hues which kueh chang is so popularly known for, but more importantly the textural contrast these little chewy cubes impart, against the more robust meat textures. The inclusion of tang kwey also has a medicinal aspect lesser known. Candied winter melon strips known for their “cooling properties”, are used to counterbalance the “heat” which glutinous rice has, in hope to bring about some kind of equilibrium or homeostasis, if I may abuse the use of this term. 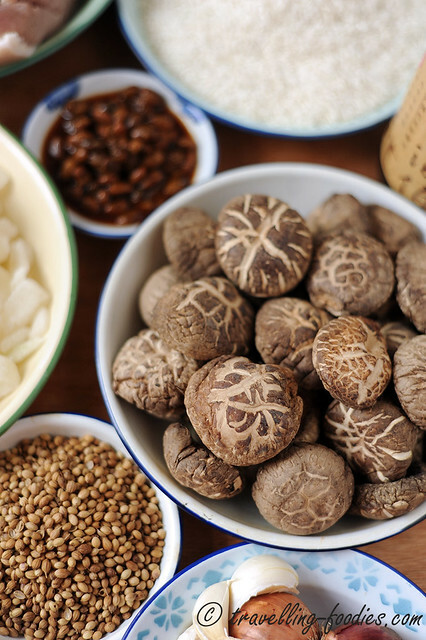 We also add chinese mushrooms into the inti kueh chang, reconstituted until thoroughly soften first before cutting into uber small cubes the same size as the pork and candied winter melon. I know of some families who do not include this but we simply love it! The aroma it imparts adds dimension to the kueh chang and beautifully compliments the flavours from the pork and taucheo. Think “pongteh” and I’m sure you know what I mean! Speaking of aromas, be sure to give the mushrooms a quick but good rinse to wash off any debris and dust before soaking them, as we usually “simpan” the ayer rendam to be used in the cooking of the filling later. Nothing is wasted! 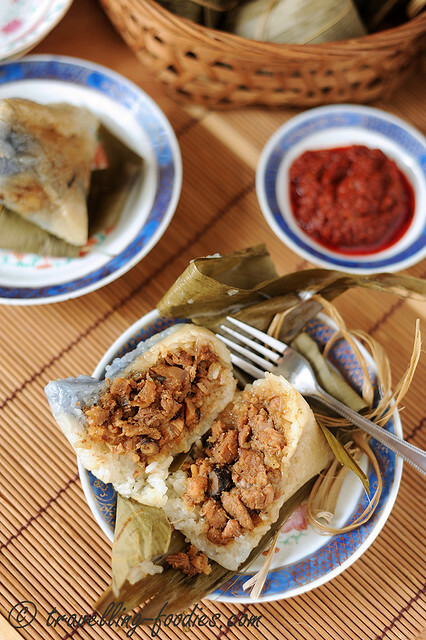 Last but not least, the duo which lends kueh chang babi its unmistakable taste, taucheo , i.e. fermented and salted soya beans and bijik ketumbeir (biji ketumbar), i.e. coriander seeds. 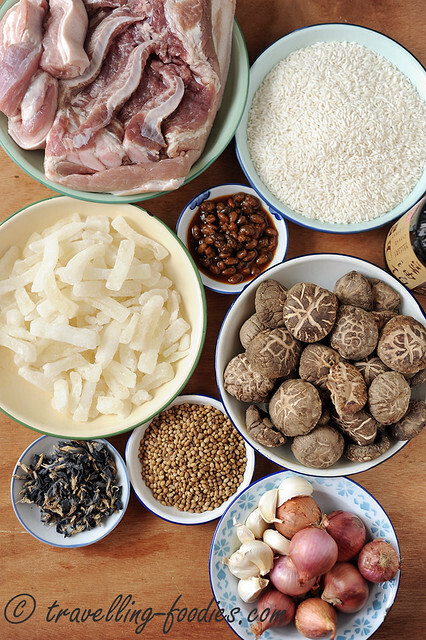 These ingredients which remind much of the flavours for Babi Chin, are quintessential for kueh chang babi. Some families and friends I know omit taucheo in their kueh chang but we love it and almost substitutes it completely for the salt component in the filling. But it is not only the savory hues which taucheo provides but more importantly, the umami flavours extracted from the fermentation process, those which one also gets from good soya sauce. For me, these subtle nuances are what makes a good kueh chang moreish! 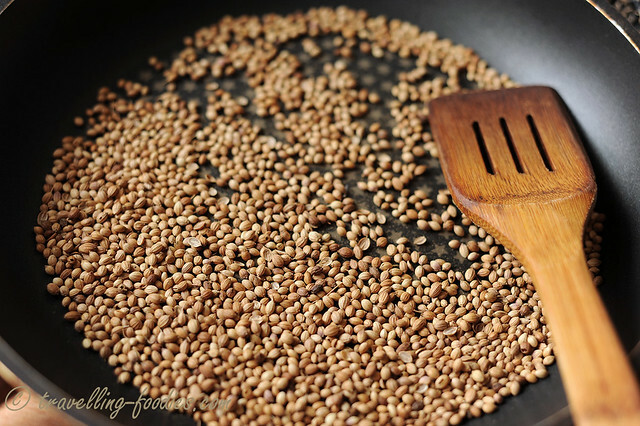 We need to “torah” the bijik ketumbeir in a clean and oiless frying pan over medium low heat, carefully tossing and twirling the coriander seeds around to ensure uniform heat distribution. This is done slowly until they unleash their bouquet of aromas, upon which they are milled finely into powder. If time is of essence once again, one may go for storebought coriander powder I suppose, but would be quick to find the smokey and toasty aromas severely lacking. Compromises come with a price, one which is often too dear to pay for a wretched discerning tongue or in this case, nose. Dried bunga telang, harvested from our own small plant, carefully rationed amongst other kuehs which also requires its anointment, like kueh sarlat and putu tegair. 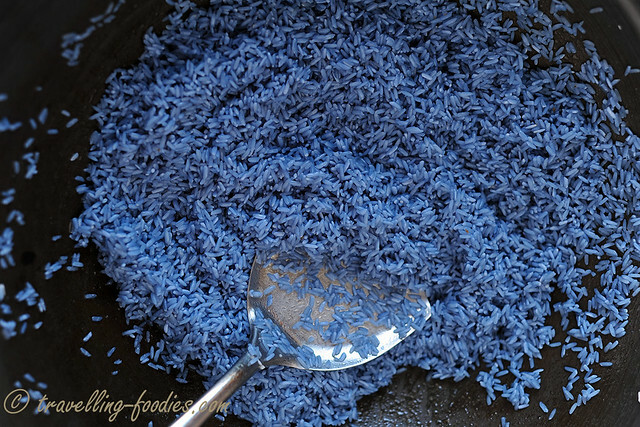 It is boiled in a bit of water to extract the dyes before using it to soak a portion of the glutinous rice which had been rinsed quickly prior. After soaking for a couple of hours, the glutinous rice is first stir fried in the rendered pork lard and some seasoning until they are partially cooked. It is first done with the white glutinous rice before those which had been stained blue. The filling should also be cooked the night before and left to cool for the flavours to mature and intensify. 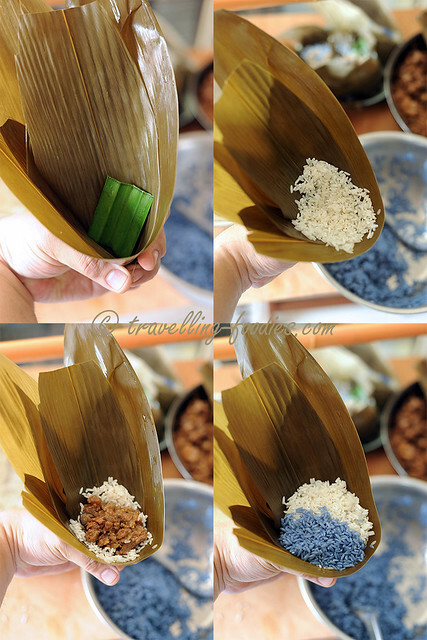 Always remember that the seasoning for the inti needs to be more “heavy-handed” than what one would expect for normal dishes, as it is not only used to flavour the filling ingredients, but also is expected to seep and season the rice the envelops it. If you feel that the taste is “just right” upon sampling while it is still in the wok, it is probably not gonna be enough after it is wrapped into the dumpling. We add a lot less tau yew, i.e. dark soya sauce than what most people would and even if we do, please choose a good brand with rich umami flavours. Every bit, no matter how small, accumulates to make the inti kueh chang really yummy. So yummy that it is good enough to be eaten on its own, which explains why this wok is not filled to the brim as it should be! 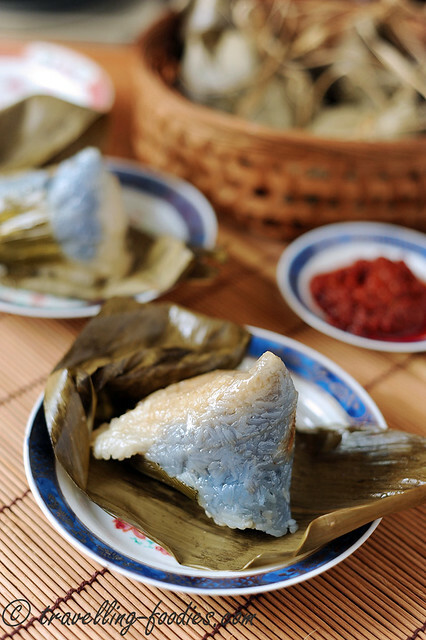 Two types of leaves are used for kueh chang babi. 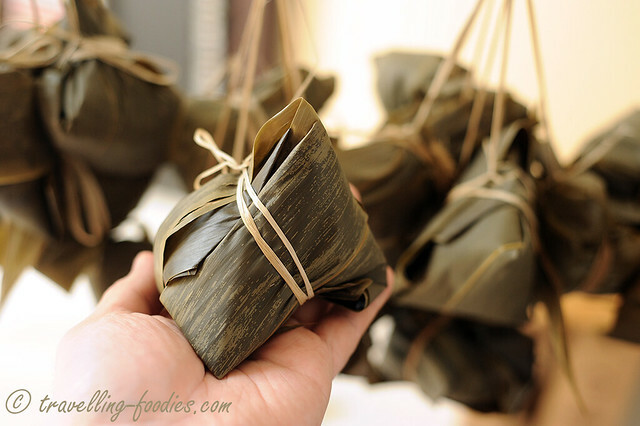 Bamboo leaves are typically used as a wrapping medium for glutinous rice dumplings, a practice of the Chinese from which the Peranakans inherited, much like what they had done, just like the celebration of bulan lima lima ari. 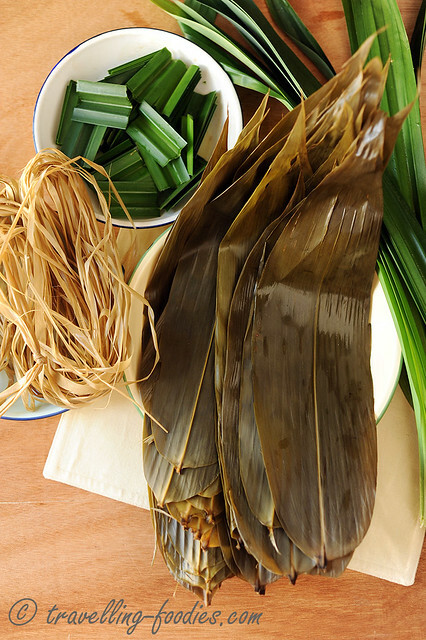 For kueh chang babi, it is common that daon pandan besair, a variety of of Pandanus which produces large leaves is used for wrapping. However, the latter is not easily available, not to mention tedious to process with the need to remove the thorny edges and boil the leaves until their fibres become sufficiently soft to be bent and willed easily by hand. There are folks, some who are even Peranakans who erroneously thought that the use of these large pandan leaves is a common attribute for discerning Peranakan cuisines between the Malaccan and Singapore communities. 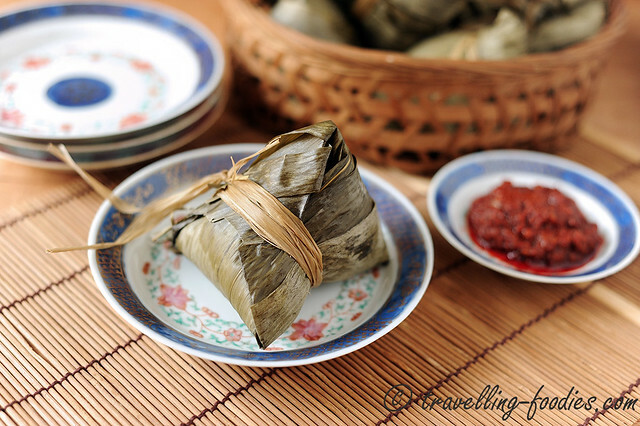 However, to the best of my knowledge, there are also Baba-Nyonya families in Malacca who use these large pandan leaves for their kueh chang if they are available. This brings to mind the credibility of these claims, or if the need to identify and initiate such differences is at all a necessity. Peranakan culture, as we know is already one which is often described as being “unique”. It leaves for one to wonder, if there should be a futher need to accentuate the level of “uniqueness” or the desire to validate the subtle differences across the various Peranakan communities. Not of the Peranakans of the present day at least. Intermarriages across various Peranakan communities between Singapore, Malacca and Penang were a common thing in the past, and so were relocations be it for prosperity or security, and many a times, both. It was very normal for one to hear friends or other relatives speak of a “dua ee” who married to Singapore or a “makkoh” who is now living in Penang, or even a distant “engku” who came from the Riau. And with these marriages and migratory stints, customs and practices may be brought forth, to influence or even take over the pre-existing ones. Those were the days when Peranakans were remarkably and if I may say, ironically more “open” to ideas and susceptible to changes, being lesser concerned over issues of “ownership” of the culture, and its “preservation”, which in my observations seems to be a highly euphemised form of cultural stagnation. Any way, I have digressed. Now let’s get back to the kueh chang, shall we? 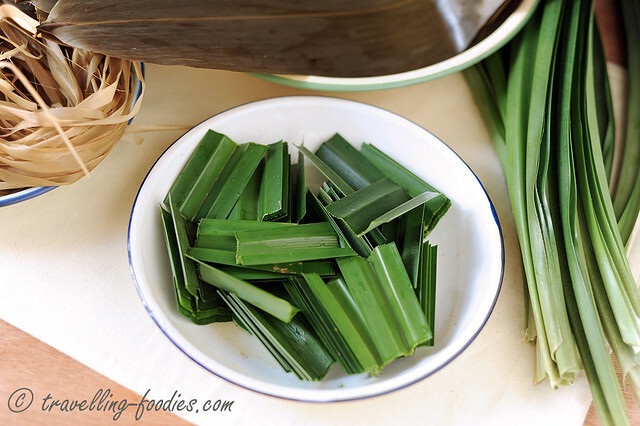 Inserted within the kueh chang and tugged under the layers of glutious rice, are these pieces of pandan leaves, which impart the lovely aroma kueh chang babi is known for. More pandan leaves are added into the water, in which the wrapped kueh chang are boiled in. It is in this “aromatherapeutic” broth, which the kueh chang should sit for a good 2 to 3 hours for the rice to become thoroughly cooked and perfumed by this aquatic potpourri of pandan leaves, which is incidentally also the primary ingredient for bunga rampey. 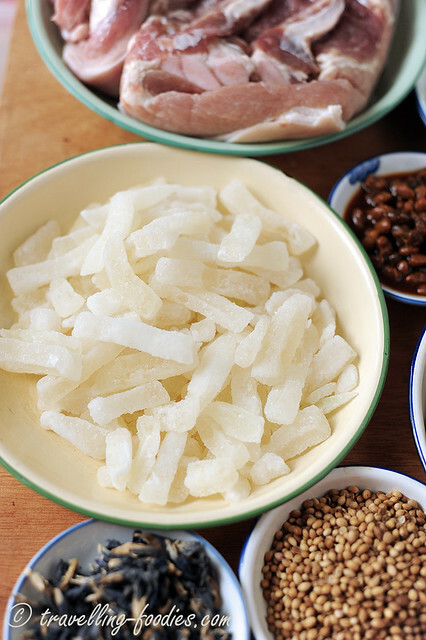 The partially stir-fried glutinous rice, in lard oil that is until they become slightly soft and sticky. Another school of thought prefers to steam the soaked rice first before using them for wrapping. There are pros and cons to both methods of course and it is really a case of individual preference over which is better for one to work on. With all the components in place, ready to rock and roll with some kueh chang making! A collage of the wrapping process, which I required a bit of time to remember the “know hows” once again after such a long break from wrapping glutinous rice dumplings. As I’d mentioned, the decision to ikat kueh chang was pretty much a last minute one, after all the large bamboo leaves have been grabbed up. In the end, I had to make do with whatever I got and occasionally do “extensions” with up to 3 pieces of bamboo leaves for one kueh chang. Now, you’d hear of other bodily and hair extensions but surely you have not done that for kueh chang have you?! 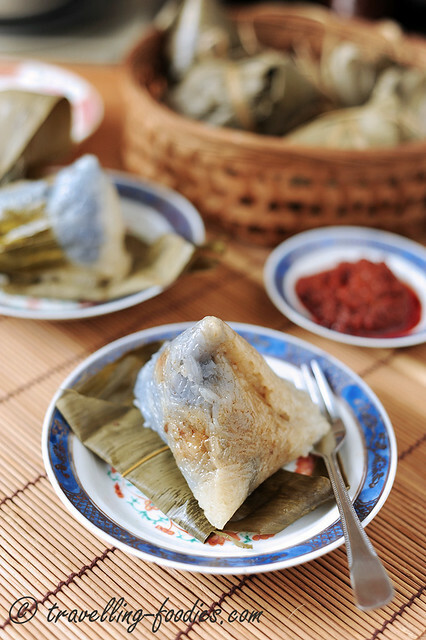 After the boiling process is done, the bunches of cooked rice dumplings are quickly hung to dry up and cool down. Resist the temptation to sample them there and then but instead, leave them to cool overnight for the packed in flavours to develop. And this is what one of the kueh chang babi looks like. As mentioned, the tint of blue is not as dark as what one would have hoped. I’d received some advice from friends on some ways to intensify the colours. Shall experiment a bit more on that. Thankfully the flavours ain’t lacking as its appeal is. 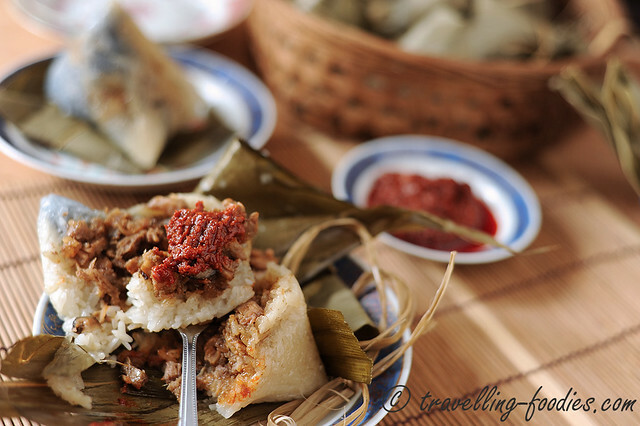 And this is kueh chang just the way we like it, enjoyed with some good sambal . Some folks like it original on its own, to be swooned by its plenitude of flavours each bite delivers, some like it with bottled chili sauce, ketchup and even sriracha hot sauce! But we love it with sambal! And don’t forget to complete the experience and down it all with a cup of teh tarik! This entry was posted on June 20, 2015 by Alan (travellingfoodies). 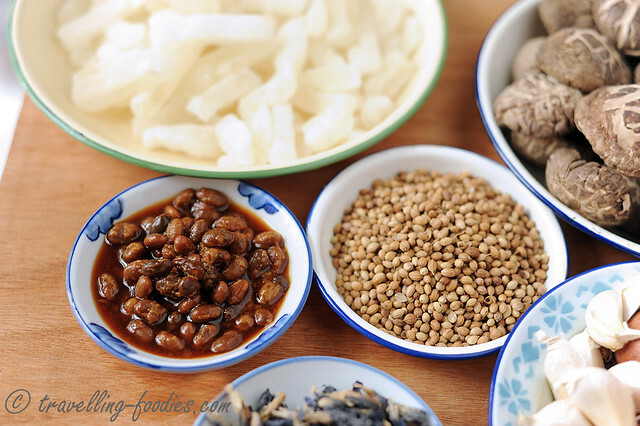 It was filed under Food, Simple Eats and was tagged with bak chang, bamboo leaves, bijik ketumbair, bulan lima, candied winter melon strips, coriander seeds, 端午, daon pandan, dried mushrooms, 肉粽, fermented soya beans, garlic, ikat kueh chang, kueh chang babi, orna biru, pork belly, rendam bunga telong, shallots, taucheo, torah, 娘惹粽. Alan: I will be praying for your Dad. Very nice kueh chang. I would like to try this one day 😀 Wish ur dad a speedy recovery. Wishing your dad get well soon. 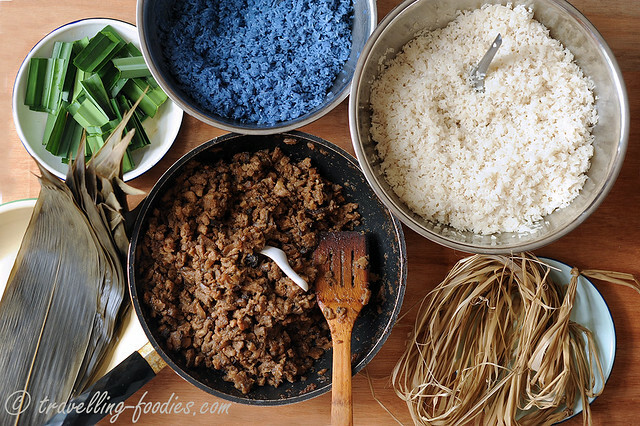 By the way, your dumpling making ingredients and steps are very similar to my mum, except that she din make the rice blue with butterfly pea flowers and add taucheo. But still the taste is great. Happy dumplings day.